David McGoldrick in action against Bolton today. 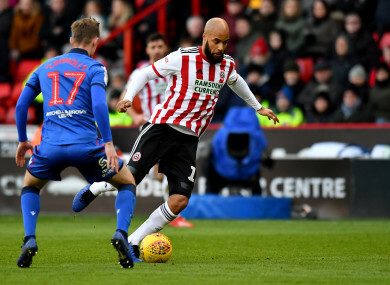 IRISH INTERNATIONAL DAVID McGoldrick opened the scoring as Sheffield United split Leeds and Norwich ahead of the sides’ meeting later tonight. United moved into the second automatic promotion places with a 2-0 win over Bolton Wanderers, who once again featured promising Irish U18 midfielder Luca Connell from the start. McGoldrick, who fell out of favour in the latter days of Martin O’Neill’s Irish reign, is expected to be centrally involved in Mick McCarthy’s squad for the upcoming Euro 2020 qualifiers. O’Neill, now in charge of Nottingham Forest, saw his team slump to a 2-0 defeat to Birmingham City. The result sees them fall to 12th in the table, five points from the play-off spot occupied by Bristol City, for whom Callum O’Dowda scored in a 2-0 win over Swansea. Elsewhere, Middlesbrough maintained their promotion push with a 3-2 win over West Brom, a result which takes them level in fourth place with their opponents. Aston Villa remain four points from the play-offs having toiled to a goalless draw with Reading, and are level on points with Hull City following their 2-0 win over Stoke. Brentford battered Blackburn 5-2 having trailed 2-0 after only seven minutes, while Ipswich’s troubles deepened with a last-gasp 1-0 loss to Sheffield Wednesday. Fellow relegation candidates Millwall and Rotherham played out a 0-0 draw while Wigan were 2-1 winners over QPR. Email “McGoldrick on target while O'Neill's Forest fall to defeat ”. Feedback on “McGoldrick on target while O'Neill's Forest fall to defeat ”.